Lodging at New Leech Lake Campground. 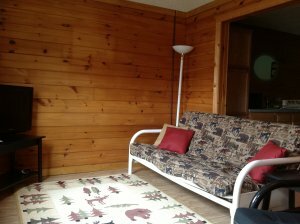 We have two units above our Lodge similar to cabins, however since they are located on the second floor above our Lodge so we call them �apartments�. Our apartments are available year round. They can be rented weekly or nightly. One apartment faces the lake and is termed the �Lake Apartment� and the other faces the camp and is termed the �Campside/Back Apartment�. One of the wonderful things about our apartments is that they can be joined together through a door so they can become one large apartment with 4 bedrooms and 2 restrooms and 2 kitchens. 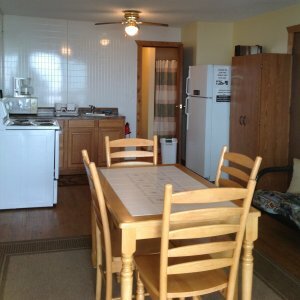 The apartments each have a full kitchen with frig, stove, microwave, toaster, coffee pot, pots, pans, utensils, plates and cups, a 3 piece washroom, living room, and bedrooms. Each apartment has a 32� color HDTV with large satellite package with 100's of channels (local, movie, food, crafts, history...EVERYTHING except the big sports package) and WIFI. You would need to bring: dishtowels, dishrag, dish soap, bath towels, washcloths, and shampoo/conditioner and body soap and a fan if desired.